Linfield boss David Healy knows full well that the encounter with champions Crusaders is a a "big game"
Crusaders and Linfield meet in the biggest game of the Irish Premiership season so far as the two pacesetters go into battle at Windsor Park. The champions ended Linfield's 100% start to the campaign by earning a 3-0 win at Seaview in mid-September. 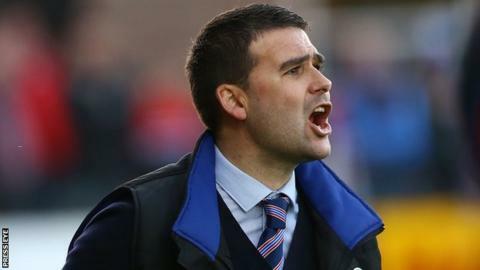 Within a month, David Healy had taken the Windsor managerial reins and the current table has the Crues ahead of the Blues on goal difference. "The Crusaders match is going to be a big game," Healy told BBC Sport NI. "They are all tough games. I knew Rodney McAree would have Dungannon well organised last week and now this weekend we've got the top two teams in opposition. "But I'm looking forward to it." There's live coverage of the five Premiership games on Saturday Sportsound, presented by Michael McNamee. Joel Taggart is on commentary with Chris Morgan for the big game of the day between top two Crusaders and Linfield at Windsor Park. We'll have updates from the other Premiership games and all the other latest sporting news. The gap between the top two could scarcely be tighter with Crusaders's goal difference of plus 24 putting them ahead of the Blues by a mere one goal. Linfield led the table on goals scored going into last weekend but their 1-0 win at Stangmore Park wasn't enough to keep them on top as the Crues earned an impressive 3-1 victory at Portadown. Seven weeks ago, Crusaders completely dominated at Seaview as Linfield, then managed by Warren Feeney, were unable to match the urgency and physicality of the champions. Healy is likely to have been studying the match video from the September contest in the run-up to this weekend's game. The game against Crusaders starts a tough-looking month of fixtures for the Blues with further contests against Cliftonville, Glenavon and Portadown to follow in November. While the top-of-the-table encounter is the big game of the weekend, there are a number of other intriguing games. Portadown travel to face fourth-place Coleraine after Thursday's apparent confirmation that Ronnie McFall's 29 years in charge at Shamrock Park is coming towards a conclusion. A statement from the club said that McFall would help in the process of finding his successor although the timeframe for the transition remains somewhat unclear. Coleraine's impressive early-season form has been emphasised by goalkeeper Michael Doherty's selection as Northern Ireland Football Writers's October player of the month. "I've put in a lot of hard work and had some extra coaching, but the boys in front of me are playing well," said Doherty who was the star in the penalty shoot-out victory over H&W Welders in the League Cup. Roy Coyle is again expected to take charge of managerless Glentoran for their game at Ballymena as the East Belfast club appear no closer to finding a successor to Eddie Patterson following Kenny Shiels's decision to accept the Derry City job. After their awful start to the campaign, Ballymena have climbed to ninth in the table but manager Glenn Ferguson was left frustrated last weekend as they squandered a 2-0 lead to draw at Carrick Rangers. Carrick are again at home this weekend against Dungannon in a game which sees the 10th and 11th-placed clubs in opposition. New Swifts boss McAree was delighted with the application shown by his players in his first game in charge against the Blues but Carrick's battling spirit was also in evidence against the Braidmen. Saturday's other game sees fifth-placed Glenavon facing improving Ballinamallard United at Mourneview Park. The Lurgan Blues' top scorer Eoin Bradley is likely to miss the game after being stranded in the Sharm El Sheikh flight chaos. The striker was due to fly home from holiday on Thursday but his family's flights were cancelled amidst fears the crash of a Russian airplane last weekend, which departed from the Egyptian resort, may have been caused by a bomb attack. "We were supposed to fly home on Thursday, then were told it would be today (Friday) and now it's tomorrow so we're getting packed and unpacked... it's not ideal," he told BBC NI. Glenavon performed impressively to earn a 1-1 draw away to Cliftonville last weekend while the Mallards earned a second straight win by beating basement club Warrenpoint Town.